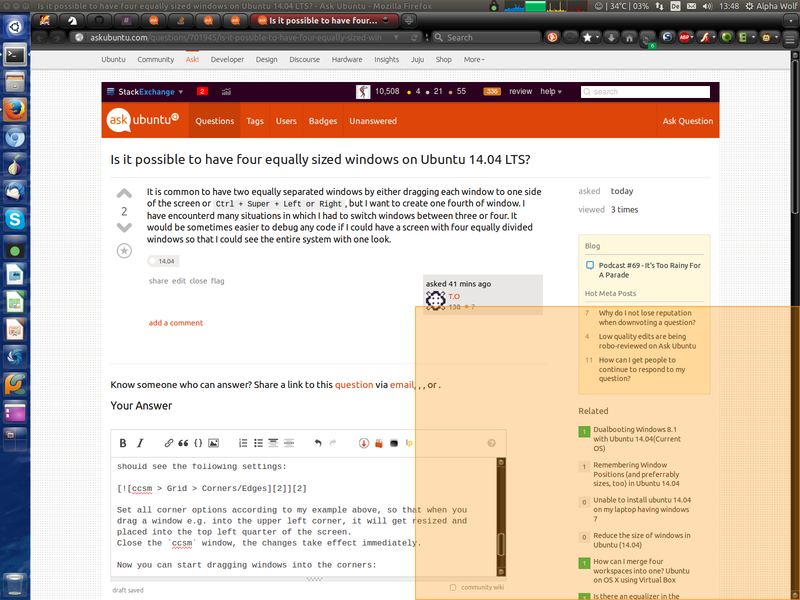 Is it possible to have four equally sized windows on Ubuntu 14.04 LTS? It is common to have two equally separated windows by either dragging each window to one side of the screen or Ctrl+Super+←/→, but I want to divide my screen into four quarters. I have encounterd many situations in which I had to switch windows between three or four. 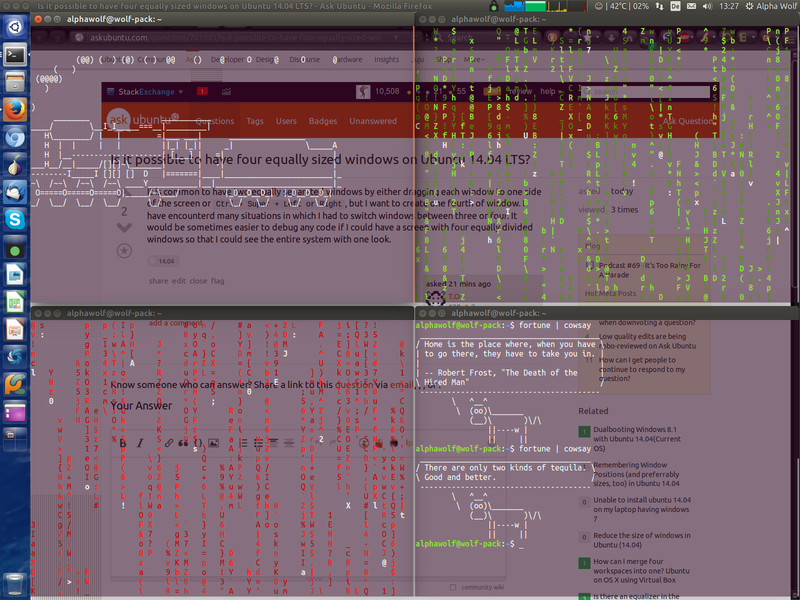 It would be sometimes easier to debug any code if I could have a screen with four equally divided windows so that I could see the entire system with one look. I did not manually resize and position the windows, which I could have done, but just dragged them into the corners of the screen to format them automatically. It's the same procedure as you described with placing a window into the left or right half by dragging it to the respective border of the screen. There are also custom keyboard short-cuts to achieve this. You can set up whichever method you prefer or both. However, the corners are by default configured the same way as the side borders and the short-cuts are probably disabled, so we have to change these settings. Therefore we need the CompizConfig Settings Manager . 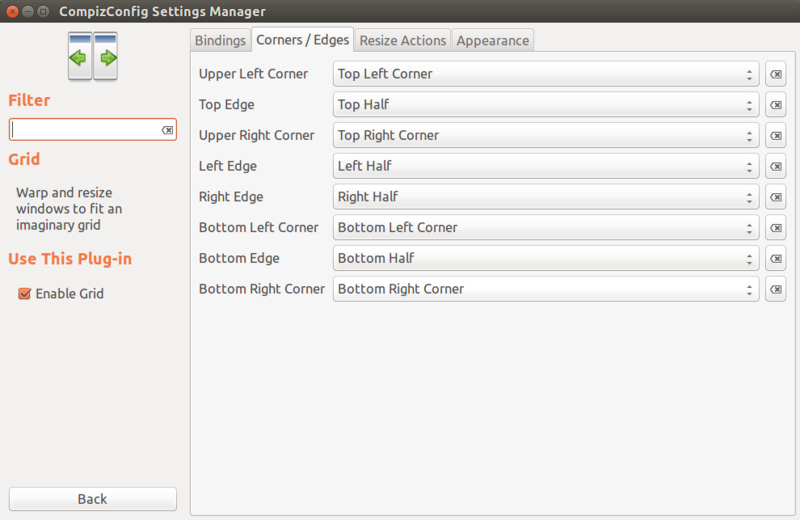 Set all corner options according to my example above, so that when you drag a window e.g. into the upper left corner, it will get resized and placed into the top left quarter of the screen. All your changes take effect immediately, so just close the ccsm window. You can do this as well with the Unity Tweak Tool. Once you installed this tool, open it and go to Window Snapping and then you can configure the window snapping on Ubuntu. There is a little application called x-tile that can organize windows in several different ways, including the way you want (tile all quad). Make sure to manually install python-appindicator (missing depency -- filed a bug for it). 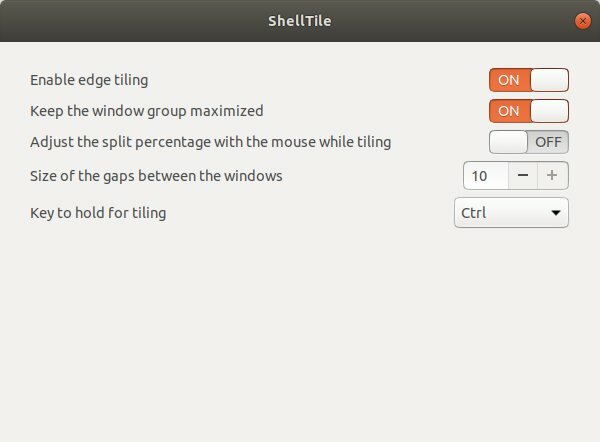 Use ShellTile to get equally sized windows on Ubuntu 18.04.1 LTS (Bionic Beaver). 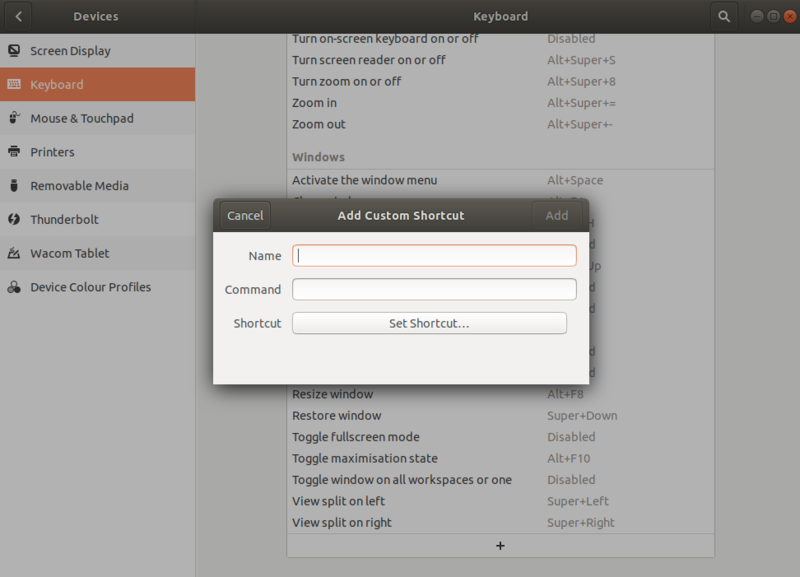 The generic keyboard settings dialogue allows shortcuts to be set for view split on left or right. Additional shortcuts can be added with the + button, although I do not know what the commands would be. Not the answer you're looking for? Browse other questions tagged compiz window-manager window or ask your own question. How to make equally sized windows in corners of the screen? 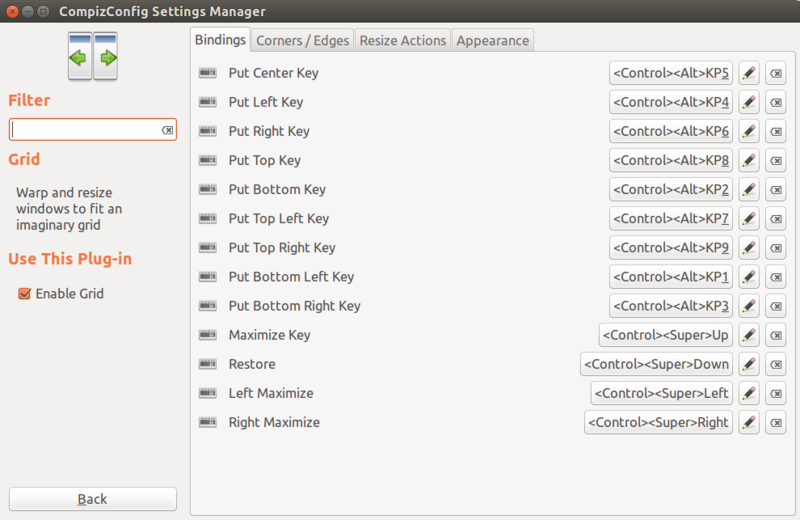 Is there any way to facilitate switching windows in Ubuntu? Is it possible to add edge resistance to Compiz “Desktop Wall” edge flipping?